Level 0: This is the level where only the drywall boards are fastened to the walls or ceiling. No taping or applying of any mud on the wall. Level 1: This level is when drywall joint tapes are used to hold joints between drywall together. This level is recommended for garages. But again, it depends on what the clients want. Like for example, if the garage is for public use, it is advisable to do more than level 1. Level 2: This next level is when you apply a thin coat of joint compound over the tape and covered the drywall screw holes. You can stop at this level if you intend to cover with wall tiles or not. Good for bathroom, workshops, basements or cellars. Level 3: After the joint tapes and mud have been left to dry out (8 hours or more recommended), you apply a second coat of joint compound to the tape and screws. Normally, compound mud tend to shrink so this next level is advised. Application of the mud is applied with a larger joint knife. This level is good for receiving a heavy texture, such as knockdown texture. Level 4: This is the level that most drywall finishes stop. Here, you apply another coat of joint compound to the tape and screws and sand the dried compound manually or mechanically. Depending on how well the drywall taping and mudding is done, no extra work is needed apart from painting except to move to level 5. Level 5: The highest possible level of drywall finishing whereby a skim coat is applied directly all over the joints and every other part of the fitted drywall boards, then sanding before painting. This is professional work at its best. Professional painters love this. This level is highly recommended to help level out and smooth the drywall before painting. Why? Well, imagining the fitted drywall boards have some bumps or some other faults. Level 5 application helps to level that out. 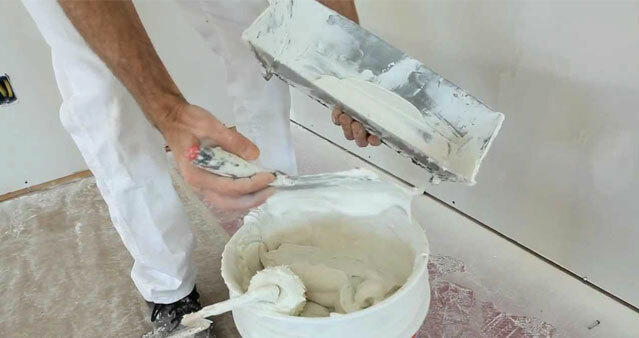 Secondly, imagining in your living room (salon), shops or offices, there is the presence of a heavy light hitting part of the walls or ceilings, the mudding is done on the joint tapes including bumps and depressions will be seen especially if you use poor paints. Now trust me, you don’t want that as it makes all the effort of having a perfect wall, worthless. Should you have a low-budget, I recommend applying this level on all ceilings and all necessary walls. You might not see the faults but curious people visiting will. At enterprise mud parfait, before the final sanding, verification is done with direct lights on the walls to see faults and if there is a need, a new application is done. The walls must be a perfect fit for painting. Nothing more, nothing less. Mur parfait is a France base enterprise established in January 2018. Its primary focus is on drywall finishing before painting, through the use of defined methods and modern day technically improved tools, which in turn, enables quick and quality finishing of the interior walls of building projects.